When Django Unchained came out, I heard many negative things about it, so I decided to wait until it came out on DVD. I now regret waiting so long to see it, for I found it thoroughly entertaining. What one has to understand about this movie is that it is not about slavery, it is about Spaghetti Westerns. Tarantino makes movies about movies. This may be incestuous, but nonetheless Tarantino is very good at it. Django (Jamie Foxx) is rescued from slavers by a bounty hunter named King Schultz (Christoph Waltz). Schultz needs Django to help him identify some wanted men. Schultz eventually takes Django on as his partner. 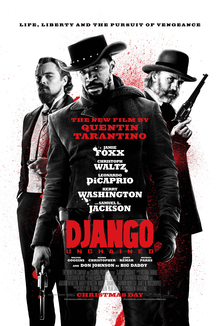 Django persuades Schultz to help him rescue his wife, Hildy (Kerry Washington) from a slave owner, Calvin Candie (Leonardo DaCaprio), whose plantation is called Candieland. The first half of the film is mostly a typical Western, but when Django and Schultz approach Candie, the film begins to take on a surreal quality. It is as though Django Unchained wants us to see slavery as something unnatural. The film goes too far however, when we learn that Candie’s shuffling slave housekeeper, Stephen (Samuel L Jackson) is the real brains behind Candieland. A common plot device in genre films is to have the character the audience least suspects turn out to be the real villain, but this struck me as a bit much. The reviews I read gave me the impression that every other line in this film contains the n-word. I was surprised to find that this is not the case. Yes, the n-word is used, but considering the time and place in which the story takes place, no more so than one would expect. What actually did bother me was the use of the n-word in Pulp Fiction, which struck me as gratuitous. Some dim-witted liberals have criticized this film because of its violence, making the unproven argument that violent movies and TV programs cause people to be violent. Tarantino has rightly rejected these arguments. Japanese pop culture is filled with images of violence, yet Japan has one of the lowest rates of violent crime in the world. How do these liberals explain this? Violence is the result of material conditions in society. Django Unchained clearly is not a realistic depiction of slavery, but has Hollywood ever tried to portray it realistically? (Gone with the Wind obviously doesn’t qualify.) There have been a number of films that tried to portray the Nazi concentration camps in a realistic manner. (Pontecorvo’s Kapò is one title that comes immediately to mind.) Yet slavery is apparently considered too painful a topic, perhaps because we are still in many ways living with the consequences of that awful institution. This entry was posted on April 30, 2013 at 8:52 am and is filed under Cinema, Hollywood, Popular Culture, Racism, Westerns. You can follow any responses to this entry through the RSS 2.0 feed. You can leave a response, or trackback from your own site. I saw Django Unchained at the Cinema when it came out and thoroughly enjoyed it. Some reviews in the UK also took is to be something more than what it is. The reason it succeeds may be that it has a lightness of touch that was absent in what I consider to be a failure – Inglourious Basterds. I must confess that I haven’t seen ‘Ingloriuos Basterds’ I will have to see it now.